In a first for the social gaming giant, Zynga is actually launching an spinoff of one of its hit Facebook games, Frontierville. Today, the company is announcing the debut of The Pioneer Trail (which will go live today), a brand new Facebook game where players outfit wagons and travel across three distinct maps – Beaver Valley, High Plains and Avalanche Pass – all while trying to reach a single destination—Fort Courage. 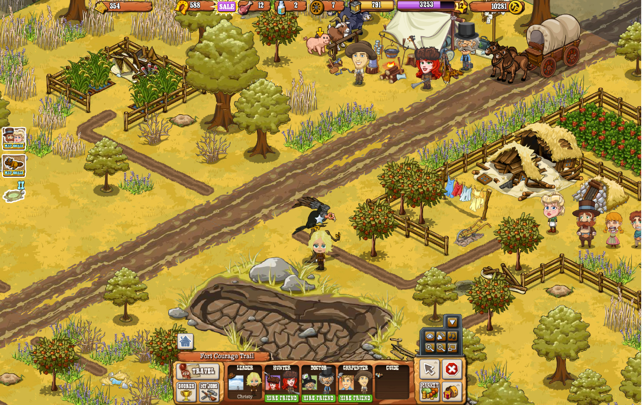 As with most Zynga games, the social game mechanics are similar but with different themes and storylines. For The Pioneer Trail, the story revolves around a young boy who has been kidnapped, named Ezekiel, by the notorious Gratchett Gang and as a player, you are on a quest to complete the trail and rescue Ezekiel from Fort Courage. The plot is a bigger part of this game than any others, and The Pioneer Trail places a pretty big emphasis the story-based gameplay. The story unfolds gradually as players come across new clues. You basically start the game by building a cabin, but instead of centralizing the whole game around this action, it only takes around five minutes to put together your homestead in the game. After your build your cabin, you load up your conestoga, staff your crew (with the hunter, doctor and carpenter) and start your way down the trail. As you make your way down the trail you complete missions, and earn points. There are many unique aspects to The Pioneer Trail, but one of the most interesting features is a social matchmaking feature. For the first time in a game, players can opt in to be matched with other players who they may not be friends with. Based on characteristics of existing groups, players can opt in for The Pioneer Trail to match them with players outside of their core group of Facebook friends. This feature won’t be live at launch, but should be available soon after. Zynga is also changing things up in terms of the social mechanics. 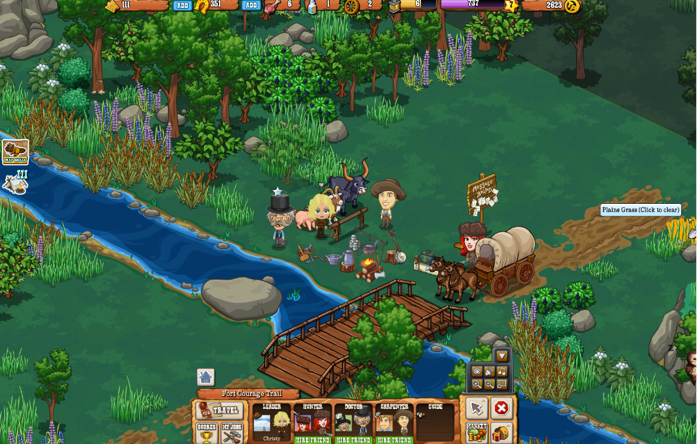 Instead of accumulating as many friends as possible throughout the life of the game, players can actually select an small group of three friends to help them along the trail. It becomes a strategy games because players whose friends are more active will progress faster throughout the game. Another differentiating feature in this game is that it is an intelligent, choose your own adventure layout with several different ways to progress in the story. The choices that players make within the game determine how they’ll fair as they journey across these mysterious and treacherous lands on the trail. After players play through a certain map, they can play it again and receive an entirely different outcome. Other differences include a much bigger hame board, and Zynga says The Pioneer Trail is about five times the size of past Zynga games. It’s also the first game to allow game progression across multiple maps and changing environments. Additionally, the game is introducing a new scoring system, where players earn trail points and prize tickets on the road to Fort Courage (where Ezekiel is being held captive). 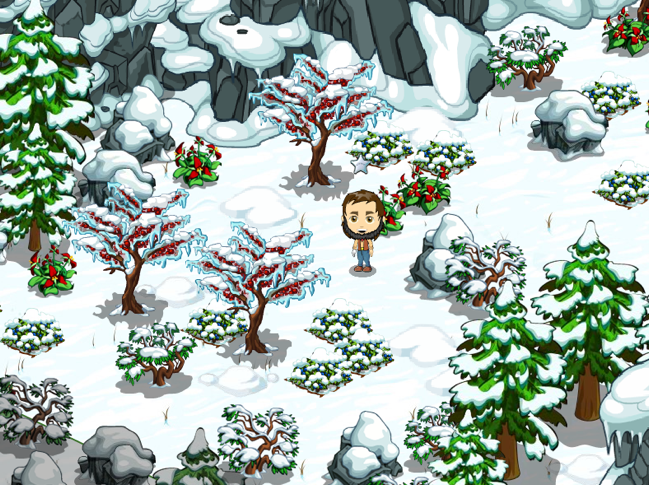 As you go down the trail and earn more points, you can unlock the ability to purchase certain virtual goods. Players are ranked against all other trail blazers and can play the game over-and-over to get a higher score. As John Osvald, GM of FrontierVille, tells us, The Pioneer Trail introduces many new social interactions and mechanics that could eventually be used for other games as well. There are no set plans in place, says Osvald, but this game is a test to see how these features resonate with users. Zynga’s been on a roll when it comes to churning out games, recently launching a Chinese version of CityVille, rolling out a CityVille iOS app, debuting Words With Friends on Facebook, and launching Hanging with Friends.